I am writing because I have two fish I am concerned about (for different reasons) and, despite trawling through your site, I am no closer to being sure what the problem is. I am therefore reluctant to do without knowing exactly what is wrong. One has a growth, and the other has two white spots. Incidentally, they are both the oldest fish in the pond. Flippy is the matriarch who has all the babies, and over the last several months has developed what looks like a benign tumour. It started with scale discolouration, then scales lifting, then the cauliflower-like growth that is there now. She is otherwise happy and healthy, and eating normally (see photos attached). Houdini is a master of survival, and lived in the shallows of the pond without our knowledge for approximately 18 months before joining the main pond about 7 years ago! He has very recently developed two white spots/growths on his side, but is otherwise happy/healthy and eating well. He does not seem to be exhibiting any strange behaviour (rubbing, scratching etc). The pond has a dirty water pump with UV filtration, which does 12000L/hr. We use Wipeout for bacterial control (though we have only ever had to use this once or twice), water conditioner in summer when the pond loses water at a faster rate, and Coptrol (aquatic Algicide with 107g/L mixed copper chelates) as needed to manage algae. I'll admit we have never needed to use testing strips in the pond, so I cannot tell you what our levels are, but the other fish are all happy, healthy and disease free. The water is also clean and clear to the eye. We do have a lot of detritus in the bottom of the pond (by design), but do control this with regular and gradual clean outs as required. There is <sic> water lilies and water reeds in the pond, and the fish are fed pellets from our local specialty fish, pond and pump supplier. They are fed in the afternoon every second day (there is rarely left over food), and seem happy with this. To the best of my knowledge, they have always been healthy and happy in the pond. Until now, really the only issue we have ever had is with Ibis (a local water bird) coming in and trying to steal fish (hence the netting in the pics)! Just in case it is relevant, I am in Perth, Western Australia and we are just going into our winter. These are generally quite mild - today it is sunny and fine, with a minimum of 8 and a maximum of 23 degrees Celsius (the average range in winter is 8-19). I will do exactly as you advise, and also look into another option for algae control. We were obviously ill-advised when we were told this was safe for fish. I have aprox 3000 gal recirculating pond with waterfall. 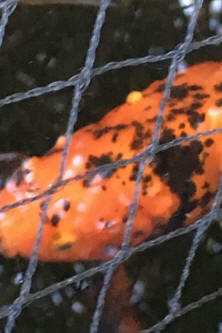 There are 7 adult goldfish (2 comets, 3 Sarasas, and 2 Shubunkins ranging from 6 to 8 inches) as well as 4 fingerlings, (native frogs that I can't keep out) and a variety of water plants. I just had the spring cleaning done by a professional (which included replacing the water) last week. There is 1 functioning aerator (a second one is waiting for repair). We also replaced the Triton ionizer anode but the controller doesn't seem to be working so are waiting for parts to replace that as well. I live in Texas. We had a gentle winter so they never truly hibernated this year. Our spring/summer warm-up began in March and they have become correspondingly ravenous. I don't feed them daily but when I do, I use Tetra season appropriate food. I converted them to the summer food when the water temp reached 60 a few weeks ago. Today (April 4) I noticed that the largest Comet has aprox 5 blisters (none of the others have any that I can detect). I last fed them on April 1 and didn't notice any blisters. The comet with the blisters is currently acting normal. It is the largest of the fish and the most voracious eater. <Could be... nuptial (breeding) tubercles (do look up)... As none of the other fishes are showing such, I doubt if there is an environmental or pathogenic issue. I would do nothing at this point... but watch the one "blemished"
Thanks so much for a quick response! Will monitor. I recently separated some Koi fry and added a few to a 150g aquarium. I'm noticing some of the fish in the 150g are whirling and I'm starting to notice some deaths. Could this be a parasite? I forgot to include parameters. This is a cycled tank with over the top filtration. Nitrates less than 10 due to the Aquaponic grow bed that filters this tank in additional to a few sponge filters. Water is moderately hard and have had no issues with my Koi in other tanks/ponds. Please help. Thanks again. The only odd thing is, I have a few other aquariums loaded with fry and only this tank is showing symptoms. I am at my wit's end and hoping you could help us. My mom has a 270 gallon reflecting pool in her back yard (with a fountain two filters, one of which is attached to a UV light). There are no plants in the pool. She has kept Orandas for years and is cleans the water regularly. Currently she has four Orandas. She feeds them sinking food. She bought Maybe on 06 May 2015 from PetSmart and introduced her into the pool without any issues. 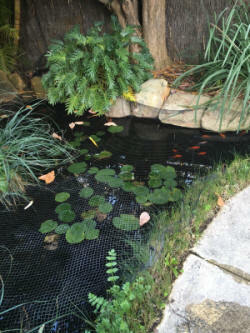 Recently, the pool had been treated when one of the other fish Fatso had white spots (Ich? ); he has been healthy for a few weeks now (about two). (before the water change and after). She turned off the UV light when she began medicating the water. The situation got much, much worse this morning (more black spots and white, raw sore under her right eye which looks like it is being eaten away and very raw). Maybe was lethargic on the morning of 16Jul2015, but she is swimming around acting normal now, not rubbing her head on the sides or bottom of the tank. Unfortunately that is the biggest container we have in the house. 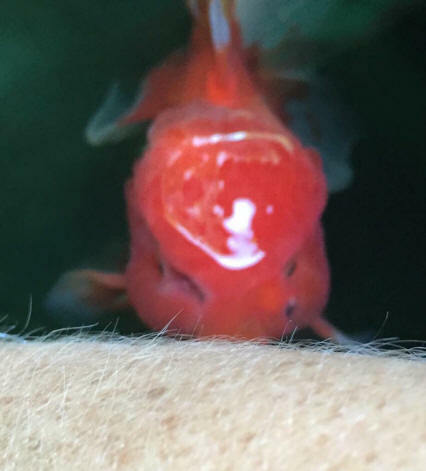 - Maybe was separated yesterday morning (16Jul2015) when my mom saw her condition, with the same pool water into a about 5 gallon fish tank equipped with aerator (mom added a little more Melafix and some stress coat). Unfortunately that is the biggest container we have in the house. Could this be hole in the head, or a fungus? What is our best course of treatment at this point? Since the container is too small for an Oranda, is there anything else we can do? We are beside ourselves! I have a small pond, 700l, with 8 Sarasa Comets that I have had for many years. There is a good filtration system with UV steriliser, and everything has been running problem free for years, with no health issues or algae problems and the fish were happily spawning (three of the fish are offspring).The older ones have suddenly been struck with an illness that I have never encountered before and I have lost 2 in quick succession. I don’t know if it’s linked, but 2 of the older ones developed a few rounded lumps over the last couple of years, which a vet identified as tumours which were not contagious and not interfering with their lives. 2 months ago I introduced a new fish after a previous one managed to beach itself outside the pond. In that time all the older fish have developed sores on their side, and in particular at the base of the tail. This is now spreading into a red patch and dissolving the central part of the tail. I have attached a picture of one that died today. At the moment the three youngest fish are not showing symptoms. Can you identify this illness and can it be treated? I don’t want to destroy the biological filtration system that has been working so well for so many years, and I also don’t want to risk the younger fish also getting ill. I would hate to do it but am considering if I have to humanely euthanise the older ones, both to prevent them suffering and to protect everything else. They have always been fed Hikari Gold in summer and Hikari wheat germ in winter. Is that not ok? Re antibiotics, I don’t believe I can buy them over the counter in the UK, also will they not destroy the biological filter? <<Personally I don’t worry too much about the nitrate. When living in London I had no problems keeping fish. Frequent water changes are important though, not overstocking, not overfeeding, and I became increasingly reliant on using fast-growing plants to absorb nitrate and keep water quality good. Floating Indian Fern for example would do this nicely, as well as provide nutrition for your Goldfish. Removing nitrate (and hardness) via RO was never cost effective for me and in terms of ecological sustainability it’s pretty difficult to justify. 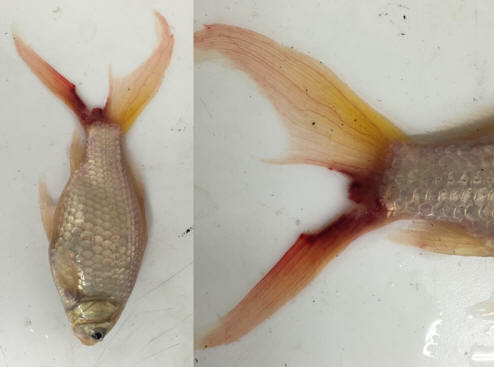 Goldfish can and do thrive in hard water and their tolerance for nitrate is relatively high (under lab conditions over 100 mg/l for short periods at least) so if the tank is otherwise well maintained, I doubt the 40 mg/l nitrate in your tap water is causing your problems. 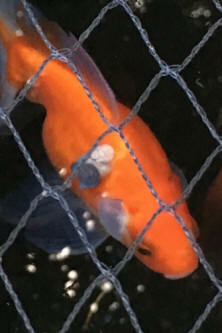 I have 2 sick goldfish, symptoms are they look bloated having trouble keeping their balance, i have been putting Myxazin P, in pond past three days, with no effect. The fish did belong to my Dad who passed away a few years ago. I am trying my best the pond holds about 280gallons, with a green gene filter. All the other fish seem to be fine, they are about 10-15yrs old. Neale, mentioned Epson salt, i have never used this, he also told me you are an expert on pond fish. I hope you don't mind me asking for your help and opinion of which I would be so grateful. i have a container that I can fill with water and put in my garage were it is a bit warmer, just put a couple of tablespoons in, in your opinion would this method work any better? Hi Bob, thank you so very much for the information, I will try the Epsom salts in the pond, as long as it won't cause harm to the rest of the fish. It is going to be 7 degrees tomorrow.